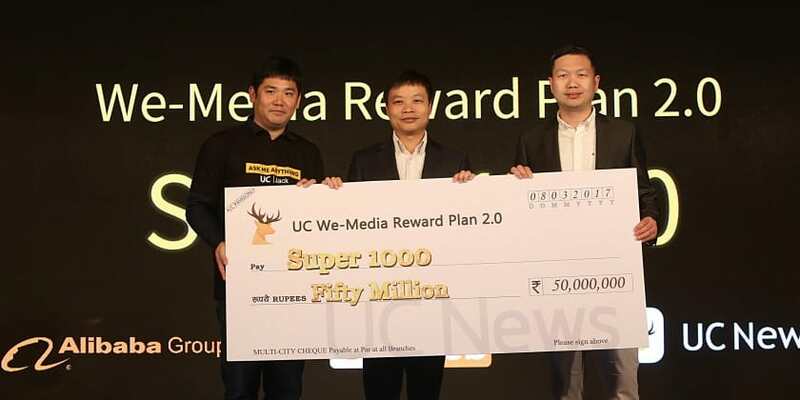 NEW DELHI: Leading the user-generated content ecosystem in India, Alibaba Group’s UCWeb Inc has announced the launch of We-Media Reward Plan 2.0, a self-creating content platform in India with an initial investment of Rs 50 million. The internet major is investing Rs 2 billion for driving content distribution in India over the next 2 years. UCWeb’s content distribution platform UC News, launched in June 2016, has registered a new milestone by becoming one of the fastest growing apps in the country with a Monthly Active Users (MAUs) of over 80 Million in India (as of February 2017). UCWeb is also upgrading its content and services portfolio by adding more short video-related content. Short Videos are fast becoming the most popular form of content consumed in China today and UCWeb sees huge potential for this concept here in India as well. UC News aims to provide upgraded content and services to its users and, going forward, will make significant investment in this category. According to the company’s latest Content Consumption Trends Report, video content has risen 30% in the last quarter alone. The company is in the process of setting up a separate team to handle the Short Videos section and is scouting for relevant partners to support this for UC News India. “The latest data on UC News shows that we generated over 3,100 million page views in January, 2017 alone, which translates to 100 million page views daily. Moreover, we are experiencing a fast rise in the average time spent on UC News. As of this quarter, an average user spends over 23 minutes on UC News. Our strong user base number indicates the success of our strategy of moving ‘From Tool to Content’. We had said that content is booming and 80 Million MAUs of UC News is a clear reflection of that. Users are embracing diverse -digital content and their appetite for such content is being met by UC News”, said Kenny Ye, GM-Overseas Business, Alibaba Mobile Business Group. Besides an upgrade in Ad revenue sharing model, We-Media Reward Plan 2.0 will open the door of opportunity to the most talented writers in the country. 1000 We-media writers will be recruited in India and Indonesia who will be able to earn at least INR 50,000 per month through the UC News platform. UCWeb has been setting new trends under the UC We-Media program where people get an opportunity to create, to write, share thoughts and engage with their followers on UC News. The Program saw an increase of 200% and 350% (MoM) in its page views of English and Hindi We-Media content respectively in the past quarter. UC News is a big-data powered content distributor, serving as a one-stop source of trending and curated news content covering all popular categories that Indian users can consume on the go, with featured channels including news, cricket, technology, entertainment, movies, lifestyle, health, humor, etc. UCWeb’s strength in technology is helping UC News process millions of data request and content of massive origins everyday with the help of its 3 big data clusters set-up in India. The cluster combines over 5000 machines handling millions of data-request with a response time of less than 10 milliseconds for each, thereby boosting the content generation and distribution on UC News to meet the demands of 80 Million MAUs. Late last year, Alibaba Holdings announced its new digital media arm, Alibaba Digital Media and Entertainment, in a major reorganization of the company’s entertainment assets. The transformation marked a total consolidation of Alibaba’s media businesses, including video website YoukuTudou, UCWeb and Alibaba Pictures Group as well as the company’s sports, games, literature, music, and the digital entertainment divisions. Alibaba Group’s UCWeb launches We-Media Reward Plan 2.0 with an initial investment of Rs 50 million 0 out of 5 based on 0 ratings. 0 user reviews.